In Brighton, indeed, in the south of England, our usual experience of snow is that it falls for one day, everyone coos and takes photographs, and then it thaws and leaves ugly muddy patches on the pavements for two or three days. So this year has been quite remarkable: you keep hearing the phrase 'once in every thirty years' uttered, especially by the council when they are explaining why they haven't got the resources to keep the city running (although this time they are doing better than our snowfall in December. After the first day, coaches with snow chains are running along the major bus routes, and most streets seem to have been gritted on both road and pavement). It snowed on Tuesday night and all day on Wednesday, and a bit on Thursday. On Friday it stopped but it hasn't thawed; and today we woke up to find it snowing again. I worked from home on Wednesday and Thursday, and stomped into work yesterday - not that I need have bothered, apart from for the company of my colleagues. My new manager was stuck between flights on her journey back to SF, and there were no meetings scheduled. My 8am meeting on Thursday was, thank goodness, cancelled, as the manager had decided to stay in London in advance of her afternoon flight out of Heathrow. On the way home last night, I stopped into a heaving Sainsburys to pick up bread, milk, catfood and vegetables, and then, a heavy bag in each hand, walked home. It was dark. The Level (a large flat recreation ground) was eerie. People were picking their way across the pitted snow which had frozen, then suddenly, out of the dark, came two women holding hands, running, speaking Spanish to each other. The homeless people were in a group, holding cans of lager, and crying out for one of their dogs. The whole Level rang with their different voices - threatening, gruff, gentle - calling "Jack!" "Jack!". You got the feeling they cried the name every time conversation paused. On the hill, a man in just a suit and tie scuttled down on the heels of his smart shoes, making arrangements to go out that night "Yes, Tim's up for it!". At the corner of Queen's Park Terrace and Queen's Park Road was a large dumped pile of what looked like dark earth, with a handleless shovel poked into the top: civic services interrupted, or an invitation for us to help ourselves? A fire engine was parked each side of the road a few yards away, lights on against the black sky. Queen's Park Terrace's pavement was a patchwork of resident's DIY attempts at gritting, including straw in one section. 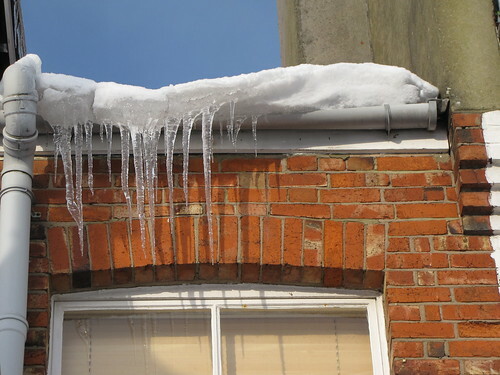 This morning, there is an enormous icicle hanging from the washing line, and more from the gutter. Item and I are about to take the sledge out. I wonder how much longer it will last. The Boy is hoping to get to Nottingham on Sunday.